How can you add fans if the front is covered? You have to take that front panel off. Its seems to me that its usually more work than its worth, unless your haveing major heat issues. But the front panel should be attached by little tabs that you have to pinch in to pull off. Something like this picture. See those black tabs on the side of the case near the top and middle. Those are usually what holds the face on. Be careful though, those tabs do break easily. There is usually three or four of those tabs on the inside of the chassis that you can simply bend out slightly. 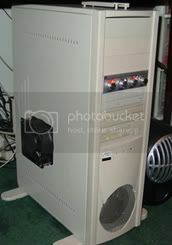 It is not difficult at all, you just have to have your CD rom drive(s) out (the faceplate prohibits the front panel cover from comming over the CD rom) and it comes right off. It really is no biggie, I take mine off all the time. As a matter of fact, it is off right now. I have 2 80mm fans sucking air in from the front in my case. Taking the front off is easy just becareful.